A huge crowd of 50,000 people had come to cheer their home team. In a memorable encounter, India played attractive hockey and outplayed Holland 3-0. Dhyan Chand had the distinction of scoring 2 of those goals. Indian goalkeeper Richard Allen had the unique record of not conceding a single goal throughout the tournament. Without doubt, India were the champions of world hockey. any years later, Dhyan Chand recalled the 1928 Olympic hockey final against Holland. "At this distant date, I still remember the circumstances in which India took the field on May 26 to win the highest honour in world hockey. I was ill, and running a high temperature which persisted all throughout the game. That day, our manager A. B. Rosser coined a slogan for us - Do or Die. I was a soldier by profession, and when the country's honour was at stake, there was no alternative but to march boldly into the battlefield." A huge crowd of 50,000 people had come to cheer their home team. In a memorable encounter, India played attractive hockey and outplayed Holland 3-0. Dhyan Chand had the distinction of scoring two of those goals. 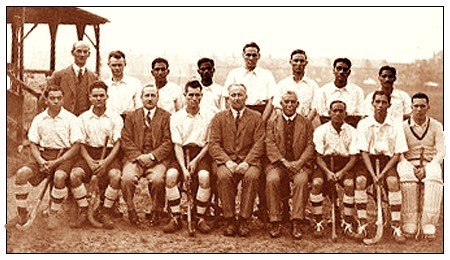 Holland put up a brave fight that impressed Dhyan Chand. A newspaper report about India's triumph said the following, "This is not a game of hockey, but magic. Dhyan Chand is in fact the magician of hockey." Another newspaper commented, "It is not only the number of goals that Dhyan Chand scores, but the way he scores them." On May 29, the Indian team lined up to receive their Olympic gold medals. When they returned to Bombay, instead of a mere 3 persons who had given them a send-off, a heroes welcome awaited the Olympic champions. There was also a unique first - the gold medal won by the Indian hockey team in 1928 was the first Olympic gold medal won by Asia in the modern Olympics.